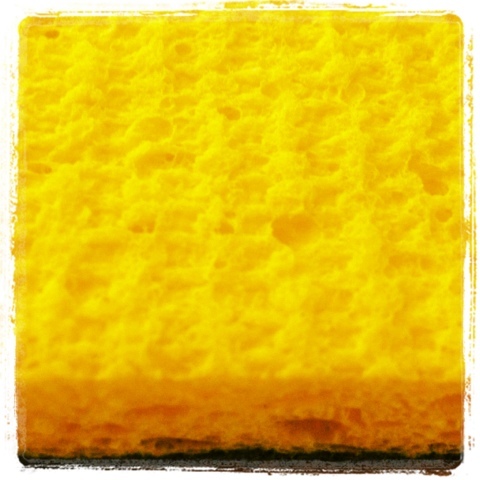 My kitchen sponge is missing. It’s been gone for over a week now. Neither of the dogs have required emergency surgery. Which is a good thing. At the end of the second day, The Assistant became suspicious that my belly rubs were a medical examination. Yup, I was looking for a belly bloated from a sponge. But where, oh, where is the kitchen sponge? I’ve gone through the garbage. Plenty of garbage, but no sponge. How do two people and two dogs create so much trash? I’ve looked through the kitchen and bathroom cabinets. Still no sponge. The Assistant is my top suspect. Did she tear up the sponge and devour it while I was out walking Barnaby? Or did she tuck it away in one of my shoes for a rainy day? As she used to do with her compressed rawhide bones. Or did I, in all my sleep-deprived zaniness (Barnaby still has diarrhea at night), place the sponge someplace strange like in the flour bin? Or behind the milk container in the fridge. I do not know. But, I’m beginning to suspect, that when and if I do find it, it will be hanging out with all of our missing socks.